The Autism Spectrum Rating Scales™ (ASRS®; Goldstein & Naglieri, 2009) are designed to measure behaviors, symptoms, and features associated with the Autism Spectrum Disorders (ASD) in children and adolescents aged 2 through 18 years. This standardized, norm-referenced instrument was initially developed to assess a wide range of behaviors associated with Autistic Disorder, Asperger’s Disorder (syndrome), and PDD-NOS, and incorporates symptom criteria from the DSM-IV-TR. The ASRS was standardized and normed on a large sample of 2,560 participants approximating the U.S. general population. Clinical samples were also created by collecting ratings from children and youth with clinical diagnoses (ASD, ADHD, Mood Disorders, Anxiety Disorders, Developmental Delay, and Communication Disorders). The ASRS have been updated to align with the revised Autism Spectrum Disorder (ASD) criteria published in the Diagnostic and Statistical Manual of Mental Disorders, Fifth Edition (DSM-5). This includes the replacement of the DSM-IV-TR Scale with the new DSM-5 Scale (this scale now includes items related to hyper and hypo-reactivity to sensory input, or unusual interest in sensory aspects of the environment). A DSM-IV-TR scoring option is still available to accommodate those users who would like to continue to generate reports with the DSM-IV-TR Scale. The terminology used in the reports has also been updated to match the changes in the DSM-5. For example, references to Autistic disorder or Asperger’s disorder have been removed, and the plural term “Autism Spectrum Disorders” has been replaced with the single diagnostic category “Autism Spectrum Disorder.” The final change includes the removal of the Delay of Communication items from the scoring algorithms. The ASRS has full-length and short forms for young children aged 2 to 5 years, and for older children and adolescents aged 6 to 18 years. The full-length ASRS (2−5 Years) consists of 70 items, and the full-length ASRS (6−18 Years) contains 71 items. Separate parent (ASRS Parent Ratings) and teacher (ASRS Teacher Ratings) rating forms are available for each age group. The full-length form provides the most comprehensive assessment information, including the Total Score, ASRS Scales, and DSM Scale. The ASRS Short Form contains items that best differentiated the nonclinical group from those diagnosed with ASD. The ASRS Short Form (2–5 Years) and ASRS Short Form (6–18 Years) both have 15 items, with parents and teachers completing the same form. This form provides a single total score, and can be used as a screening measure to determine which children and youth are likely to require a more comprehensive assessment for an ASD. The ASRS Short Form is also suitable for monitoring response to treatment/intervention. The ASRS can be scored via paper-and-pencil and electronically. The ASRS Scoring Software and ASRS Online Assessment Center offer three report options: (1) an Interpretive Report with detailed results from one administration, (2) a Comparative Report providing a multi-rater perspective by combining results from up to five different raters, and (3) a Progress Monitoring Report that provides an overview of change over time by combining results of up to four administrations from the same rater. The ASRS Technical Manual provides step-by-step interpretation guidelines and an illustrative case study. An especially useful feature of the ASRS is the ability to compare results across raters. This can help determine if there is consistency across home and school contexts. Discrepancies can provide insight into differential responses and determine which symptoms are more prevalent in a particular setting. The ASRS has strong psychometric qualities. Reliability data indicate high levels of internal consistency, good inter-rater agreement, and excellent test-retest reliability. Discriminative validity (classification accuracy) of both the ASRS full-length and ASRS Short Form indicate that the scales were able to accurately predict group membership with a mean overall correct classification rate of 90.4% on the ASRS (2-5) and 90.1% on the ASRS (6-18). Although the ASRS Technical Manual reports a moderate relationship between the ASRS Total Score and the Gilliam Autism Rating Scale, Second Edition (GARS-2) and the Gilliam Asperger’s Disorder Scale (GADS), criterion-related validity would have been enhanced by examining the consistency of the ASRS with a gold standard instrument such as the ADOS or ratings scales such as the Social Communication Questionnaire (SCQ) and Social Responsiveness Scale (SRS). The GARS and GADS are not currently recommended and should be used with caution due to significant weaknesses, including poor diagnostic utility and sensitivity in identifying ASD, and questions concerning standardization and norming procedures (Campbell, 2005; Norris & Lecavalier, 2010; Wilkinson, 2016). In summary, the ASRS is a valuable tool that can help guide diagnostic and educational eligibility decisions, as well as for use in monitoring response to intervention and evaluating treatment outcomes. It is a reliable and valid instrument for assessing symptom severity across home and school contexts. Consistent with best practice, the ASRS should be used only as part of a more comprehensive developmental assessment that includes interviews and direct observation, together with a multidisciplinary assessment of social behavior, language and communication, adaptive behavior, motor skills, sensory issues, atypical behaviors, and cognitive functioning. An example of a comprehensive assessment battery can be found in A Best Practice Guide to Assessment and Intervention for Autism Spectrum Disorder in Schools (2nd Edition). Campbell, J. M. (2005). 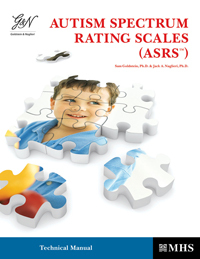 Diagnostic assessment of Asperger’s Disorder: A review of five third-party rating scales. Journal of Autism and Developmental Disorders, 35, 25-35. Goldstein, S., & Naglieri, J. A. (2009). 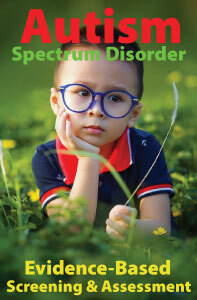 Autism Spectrum Rating Scales (ASRS) Technical Manual. Tonawanda, NY: Multi-Health Systems, Inc.
Goldstein S., & Naglieri, J. (2014). Autism Spectrum Rating Scales (ASRS) Technical Report #2. Toronto, Ontario, Canada: Multi-Health Systems. Norris, M., & Lecavalier, L. (2010). Screening accuracy of level 2 autism spectrum disorder rating scales: A review of selected instruments. Autism, 14, 263-284. Wilkinson, L. A. (2016). 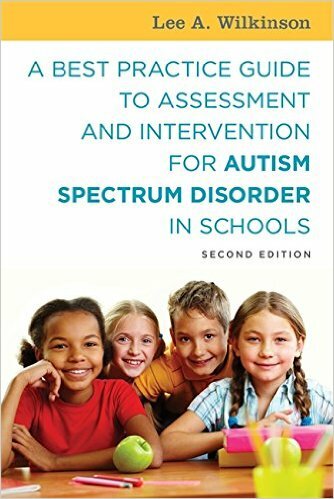 A best practice guide to assessment and intervention for autism spectrum disorder in schools, second edition. London and Philadelphia: Jessica Kingsley Publishers.